Whether you live on island or visiting, Hawaii never ceases to amaze, inspire, and bring out what we call the "Aloha Spirit". The Hawaiian Islands are like no other place on earth with diverse landscapes from lush mountains to tranquil turquoise waters; Hawaii truly has it all to offer. It is my passion to capture the spirit of the Hawaiian islands, the emotions that this experience brings, and leave you with imagery that will allow you to relive this moment forever. I offer numerous packages and flexible options to meet your needs and look forward to capturing special moments with the couples, children, and families that grace our shores. As a travel and portrait photographer, my work combines and aspires to capture the essence of the beauty in scenes and people in an environmental portrait style. 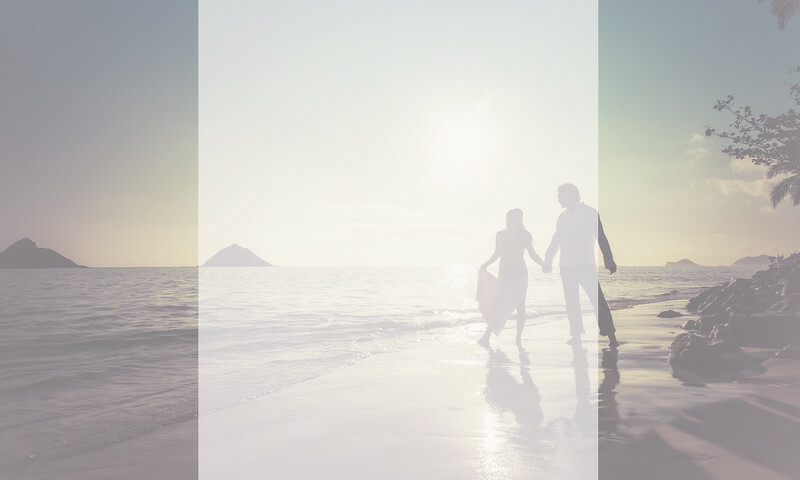 Specializing in couples, families, engagements, and working with little ones, I will guide you through a fun, exciting, and relaxed experience on some of the world’s top rated beaches. Please review this guide to get an idea of what to expect when working with me, as well as a general view of things to consider when looking for the right photographer. Please never hesitate to contact me with any questions you may have! Q: Are you permitted and insured? A: Yes! Hawaii has interesting laws applicable to all commercial photography taking place outdoors on state and county land. They can be complex, but rest assured I obtain appropriate permitting and maintain required insurance as well keep up to date with changes. It's important for my clients to know I take what I do seriously and take great pride in my work. Q: Where are you based out of and where do you travel? A: I am based in Kailua, Hi. on Oahu, just 20 minutes north of Honolulu, and roughly an hour from Ihilani, Ko' Olina, and the North Shore. I do travel to all Hawaiian Islands based on availability and subject to current market travel rates with deposit. Q: Do we have to pick a location or do you guide us? A: Both! As most of you are visiting, I can serve as your guide to the best locations the islands have to offer. I have numerous locations I prefer that are absolutely breath taking, less crowded, and offer diversity to get the most out of your Hawaii photoshoot. Whether you're traveling with young children and prefer a calm scenic beach, or an adventurous couple looking for something a little more extreme, I have the perfect location for you. If you have a specific location in mind I can certainly accommodate you as well. Q: What is it like working with you? What should we expect before, during, and after our photoshoot? A: As a creative and passionate small business owner my goal is to provide not just a service but an experience. Personally, I am very light hearted, easy going, flexible, and warm. Upon contact I may ask you a series of questions to get a better idea of your needs, expectations, and work with you on choosing the right location and timeframe as well as answer any questions you may have. Once we set a date, time, and location, you will receive a confirmation along with a map link and directions. During the shoot I have one expectation from my clients. Have fun!! While I am always open to ideas, I will guide you throughout the shoot which vary dependent on what poses I feel would work best for you, the location, the lighting, the occasion of the shoot, etc.. Every single shoot is different which is why I love what I do so much! It gives me the ability to use my skills, knowledge and creativity to get the best images possible. After a shoot I archive all images, proof, select images that meet my quality standards and edit which can take approx. 7-10 days. Once the images are ready I will create a private online gallery for you to view and choose your final images at your leisure. Once you make your selection you will receive a download link for your chosen full resolution, edited images. I do maintain the original gallery active for you to revisit at anytime. I use full frame equipment (5dmkII and 600ex-rt for most shoots), so you can expect high resolution, large images for optimum quality and large format print capability. Q: Do you give unedited images to clients? Q: What should I consider when choosing a photographer? Q: Do you offer extreme location photoshoots? A: Why yes, I do! While not for everyone, I do offer photo sessions/tours to some of Oahu's amazing hidden gems. Want to go on a ridgeline hike to a peak above, kayak to a remote offshore island, explore a waterfall in the rain forest? Contact me today to inquire! Hope your travels are as amazing as your dreams!